For the past several years, South Sudan has spiralled out of control. The nation’s still young history is marred by brutal conflict and failed peace agreements, creating one of the most extreme humanitarian crises in the world. As another Cessation of Hostilities agreement falters and hopes dim for regional leadership during a time of upheaval in Ethiopia, it is time for the European Union to more clearly and consistently assert leadership and develop much-needed financial leverage that could support a truly reinvigorated peace process. The European Union provided over 350 million euros in aid to South Sudan in 2017, focusing particularly on assistance to South Sudan’s neighbours facing serious challenges related to caring for the more than 2 million refugees, who have crossed the border in search of safety. The United Kingdom plays a leading role in international diplomacy on South Sudan through its place in the “Troika” (along with Norway and the United States), and a number of EU member states play critical roles in providing development assistance and support to South Sudan and the broader region. Across the Atlantic Ocean, the United States remains a critical player on South Sudan policy issues. It has taken a number of strong steps to address the crisis since September 2017, including both the U.S. Department of the Treasury’s unprecedented issuance of an anti-money laundering “Advisory” to highlight concerns about corruption directly for the banking sector and the U.S. Department of Commerce’s non-sanctions measures focused on the oil sector. But the United States’ overall diplomatic strategy and level of engagement remains unclear, given the myriad uncertainties in the Trump administration, underscored by the recent dismissals of U.S. Secretary of State Rex Tillerson and U.S. National Security Advisor H.R. McMaster. This, combined with paralysis on South Sudan in the U.N. Security Council, creates both an opening and a need for clearer action by the European Union to address the crisis. To date, the European Union has principally answered with financial aid and humanitarian support, rather than a comprehensive approach that matches this critical engagement with meaningful leverage to drive change. Without this modernised approach to financial leverage and associated incentives—the likes of which have never been used by the European Union with respect to conflicts in sub-Saharan Africa—the crisis and suffering will persist. On 2 February 2018, the European Union did take a first small step in this direction by designating for sanctions three current and former senior South Sudanese officials. 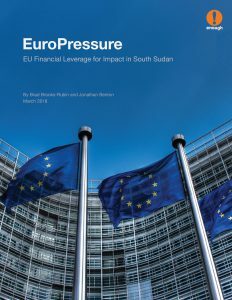 The European Union should ensure that this is not an isolated action, but the first step in a sustained approach that follows this action by imposing and enforcing elevated financial pressures on other South Sudanese spoilers, from within the government and the opposition, who are driving violence and connected to grand corruption. Where possible, these measures should seek to impact the myriad companies that these leaders and their families own or control. • Designating for sanctions key spoilers of the peace process and their business networks. Sanctions placed on only a few individuals and that lack enforcement are ineffective. Sanctions measures must impact not only individuals, but also their networks. Where possible, companies owned or controlled by those sanctioned should be included in EU actions, either formally or through indirect means, such as communications of names to banks. • Issuing warnings or alerts to financial institutions concerning AML risks related to South Sudanese politically exposed persons (PEPs). These actions would have the greatest impact if EU member states with the most developed financial services sectors, such as the United Kingdom or Germany, take the lead. • Engaging neighbouring governments. EU delegations should pressure key countries in the region, notably the financial intelligence units, central banks, and ministries of foreign affairs in Uganda and Kenya, to take action on AML risks related to South Sudanese PEPs. The European Union’s leverage with Kenya, a country that has focused heavily on developing its banking sector, has increased as it holds an increasing share of the country’s growing debt. • Meeting with banks active in the region. In addition to governments, EU missions can highlight the risk of illicit activity and money laundering in relation to operations in South Sudan or with South Sudanese PEPs through direct meetings with banks. This includes major banks in the region, as well as those providing correspondent services from London, Berlin, and elsewhere in Europe. • Imposing sectoral-based restrictive measures on economic sectors that are under the control of certain political and military elites, such as the extractive industries, banking, and transport sectors. These measures need not be limited to asset freezes and travel bans but other measures that encourage responsible business behaviour by European and other companies, such as due diligence reporting requirements or more stringent limitations on lending. • Further developing its autonomous evaluation process of high-risk third countries that have strategic deficiencies in their AML/CFT regimes that pose significant threats to the EU’s financial system (rather than restricting to those countries that are of “economic importance” to the European Union). • Becoming a cooperating member of the Eastern and Southern Africa Anti-Money Laundering Group (ESAAMLG). • Convening discussions on governance conditional to disbursing non-emergency aid, and reassessing multilateral loans to government institutions led by corrupt politicians, like the Cotonou Agreement. Deployed in a patient, persistent, and coordinated manner, these tools can build the leverage needed to finally change the calculations of those who have pushed South Sudan to crisis and strengthen the European Union’s role beyond one of providing never-ending financial and humanitarian assistance with no hope for a solution.